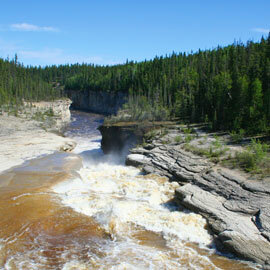 WATERLOO – Two key players in the recent negotiation of an historic agreement between the Northwest Territories and Alberta to govern the water resources of Canada’s largest watershed will visit Wilfrid Laurier University for the first-ever public discussion of a deal that will affect transboundary water issues across Canada and beyond. Minister Michael Miltenberger of the Government of the Northwest Territories (NWT) and Chief Negotiator Merrell-Ann Phare will explore the implications of the Mackenzie River Basin Transboundary Agreement for Canadian water and energy policies and they will share their story that led to its signing by the NWT and Alberta governments in March. Laurier’s President and Vice-Chancellor Max Blouw will moderate the discussion, which will take place April 29 starting at 1:30 p.m. in the Maureen Forrester Recital Hall on Laurier’s Waterloo campus. The Mackenzie River watershed is the largest and longest river system in Canada, covering almost 20 per cent of Canada’s landmass and touching portions of five provinces and territories. Reports indicate the watershed is threatened by climate change and development upstream including the Alberta oilsands and British Columbia’s hydro dams. Following the NWT-Alberta agreement, 85 per cent of the basin will be protected, with the NWT and Alberta governments committed to managing water resources along the watershed collaboratively and sustainably to benefit the environment, communities and the economy. The agreement ensures the governments will communicate about developments and substances that could affect aquatic ecosystems. It will help ensure that water management plans adapt based on scientific monitoring. It will also respect the jurisdiction of governments and ensure water is collaboratively managed for the benefit of the environment, people and the economy. Laurier is a fitting location for the discussion, given the partnership agreement between the university and the Government of the Northwest Territories (GNWT) established in 2010, through which Laurier is helping the GNWT establish a strong foundation for scientific studies on future changes to the NWT landscape, natural resources, communities and people in the face of a changing climate. Laurier has made a significant research investment in cold regions and water science. The university has three Canada Research Chairs in Cold Regions and Water Science, Cold Regions Hydrology, and Forests and Global Change who work in the NWT, and more than 20 graduate and undergraduate students who will be trained in the region in 2015. In October 2013, Miltenberger represented the GNWT’s support at the official ribbon cutting of Laurier’s leading-edge Centre for Cold Regions and Water Science, which houses Laurier’s Canadian Aquatic Laboratory for Interdisciplinary Boreal Ecosystem Research (CALIBER); Laurier’s Cold Regions Research Centre (CRRC); and the Laurier Institute for Water Science (LIWS). The Honorable J. Michael Miltenberger is one of the longest-serving members of the Legislative Assembly of the Northwest Territories who has served the constituents of Thebacha since his election in October 1995. He is the Minister of Environment and Natural Resources, Minister of Finance, Minister responsible for the Northwest Territories Power Corporation and Chair of Financial Management Board. Miltenberger leads the Committees on Climate Change and Refocusing Government. Born in Ottawa, Miltenberger was raised in the NWT. He earned a BA (Sociology) from the University of Lethbridge and later received his certification as a journeyman carpenter through Arctic College in Fort Smith, NWT. Prior to his election to the legislature, he worked for the government of the NWT and served as councillor and mayor for the Town of Fort Smith. Merrell-Ann S. Phare, BA, LLB, LLM, is a lawyer, writer and the founding executive director of the Centre for Indigenous Environmental Resources, a national First Nations charitable environmental organization. She is the author of the book Denying the Source: the Crisis of First Nations Water Rights and co-author, with Robert Sandford, of Ethical Water. Merrell-Ann was Chief Negotiator on behalf of the Government of the Northwest Territories in their negotiation of transboundary water agreements in the Mackenzie River Basin. As a member of the Forum for Leadership on Water (FLOW) she has long promoted the need for a national water strategy. She is legal counsel and advisor to a number of First Nations and other governments and organizations and regularly speaks on water issues and First Nations. The April 29 event will include a formal presentation by Miltenberger and Phare beginning at 1:30, followed by a panel discussion with comments from William Quinton, Laurier’s Canada Research Chair in Cold Regions Hydrology and a director of the Cold Regions Research Centre, and Simon Dalby, Centre for International Governance Innovation (CIGI) Chair in the Political Economy of Climate Change. A reception will take place at 3 p.m.
To register for the event, please visit eventbrite.ca.